At 43, ‘Maman’ Kalunga, as her relatives call her, is worried about the education of her children of 6 and 12 years old. It is not easy to feed, clothe and educate kids when you are poor and live on the crossroads of 17 Street and Sakania Avenue in Katuba, Lubumbashi in Katanga province in the south of the Democratic Republic of Congo. Kalunga had therefore been ecstatic when, seven years ago in 2010, just in time for first grade of the eldest one, a school had been rehabilitated by the World Bank close to where she lived. Until that time the school, 200 meters up the road, had stood dilapidated and empty, without books or desks and teaching happened irregularly, if at all. But now, thanks to the World Bank and its partnership with the government’s Social Fund, “it had everything,” she remembers, “desks, chairs, materials, two libraries, bathrooms and a management office.” The Bank had even built a pretty fountain at the entrance to the court yard. The pictures of how nice it looked, back then, are still displayed on the World Bank’s website, next to an article about the success of the project (1). But that is not how it looks now. “We are back where we started,” sighs Kalunga. Windows are broken, as are the toilets and washbasins. Books, desks and even doors have been stolen; homeless people sleep in the corridors and parents have to fork out eight thousand Congolese francs per month (the equivalent of US$ 5, a week’s income for most people here) to send their children to drafty classrooms where even pencils and paper are scarce, in the hope that they’ll get some teaching. Head master Placide Lyombo tall, pale, and fatigued-looking, says parents and teachers had hoped for an annual budget for upkeep, but that had apparently not been part of the plan. As soon as the World Bank project was finished, the government’s Social Fund had stopped contributing, too. “It would just be great if we received new teaching materials. And funds for a fence to keep the riffraff out,” says Lyombo. But he doesn’t have much hope that that will happen anymore. 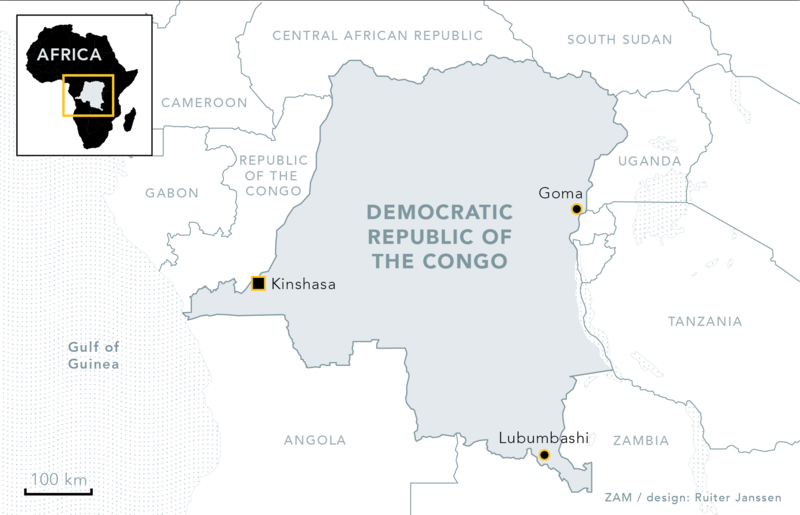 It’s only one case, almost a negligible one perhaps, among the twenty-nine active World Bank projects in the Democratic Republic of Congo at a total input of US$ 3,8 billion. But the experience illustrates what often happens when donors build infrastructure. Whether it is schools, roads, electricity lines, houses or any other such things that need upkeep and maintenance, not to mention -in the cases of houses and schools- services like electricity, water, and security: the World Bank may spend a whopping 63 % of all its investment and lending in this country on it, but it can’t stay around to make it work. Training teachers, supplying books, conducting repairs and supplying power are things a government must do. And in the DRC, it generally doesn’t. “The project is going very well,” says water company director Gervais Ntariba. “Two thirds of Kinshasa’s citizens have clean running water by now.” He looks so earnest and serious that for a moment we feel that we found ourselves in an alternate universe. Surely he is not talking about this Kinshasa? This morning at the Binza health centre, there hadn’t been water to assist ten pregnant women about to give birth. And Binza is in Ngaliema, the urbanised, central quarter where NGO offices are and middle class people live. Even Ngaliema people often use their cars to go get water at pumps kilometres away, and they are the lucky ones. Everywhere in town, at all hours of the day and night, one comes across people looking for water, from 5 years olds to pensioners. After leaving Binza, we had come across a 70 year old lady sweating and panting with the 25 litre bucket of water she had fetched an hour ago. Figures published in the yearbook by the National Statistical Institute in October 2014 show that in Kinshasa only ten percent of the population has taps inside their houses, with fifty-six percent accessing water somewhere in their streets, and a third having to walk for long, every day. The figures do not even mention the outskirts where the poorest of the poor have to buy water at inflated prices from traders who bring it in from taps closer to the centre. Our disbelief makes water company man Gervais Ntariba, rather angry. He insists that the US$ 190 million World Bank project called PEMU (‘Project Eau Potable en Milieu Urbain’) started in 2006, is already massively increasing clear running water access in main cities. He also seems to believe that the national water company, Regideso, is not dysfunctional at all. “It can only survive on bail outs from international donors and subsidies from the Congolese state.” Charles Mbikayi Tshibangu of Kinshasa’s Institut Superieur de Commerce had written in 2008 (2), ten years ago, when there had been only 265000 taps connected to Regideso’s frequently faulty pipes. Three years ago, the World Bank itself had admitted that Regideso couldn’t even get its own government’s departments pay their water bills or get its own meters to work. The Bank had been confident that these problems would soon be fixed, but even Charles Mbuta Muntu, secretary of the state’s National Water Action Committee, had told us that he doubted that Regideso would be able to live up to expectations. “The government only spends 1% of the national GDP on water,” he had said, shrugging. According to the World Bank’s project documents it has contracted Chinese and South African companies, among others, to build and repair plants, pipes and meters in Kinshasa and two other cities, but the documents do not say how the Bank will ensure that the pipes won’t rust and the meters break down again. After initially claiming (3) that the majority of people not just in Kinshasa, but in the entire DRC, would have clear running water by the end of 2015, the project has meanwhile been extended and is now expected to finish in 2018 (4). After Ntariba we still see Regideso project manager Nestor Manduku, who is equally adamant that all will work well and that the new water collection and treatment plant will start operating by end 2017. Then he admonishes us: “As soon as you finish writing your article, you come back to show it to me for validation before you publish.” It is an instruction, not a request. Moving away from infrastructure and all its upkeep and maintenance problems, we drift into the DRC’s majestic forests. It is vital that these be protected, not just on behalf of the country and its people who -in the absence of government services- often live off wood, farming, fishing and hunting, but on behalf of the lungs of the entire world. The Congo’s forest reserve is the biggest after the Amazon. The country’s REDD (Reducing Emissions from Deforestation and Forest Degradation) programme, that aims to protect the trees as well as the forest communities through environment-friendly training and employment initiatives is therefore surely worthy of World Bank and other donor support. It’s just that, here too, our government seems to handle such urgent issues rather differently. In 2015, it already angered donors and environmental organisations by illegally breaking its own moratorium on new wood logging licenses by allowing two Chinese headquartered companies, Fodeco and Somifor, to just get in there and cut trees, too. Greenpeace had lodged an official complaint against then environment minister Bienvenu Lyota, who had handled these contracts (5). A court case against Lyota was started, but so far it doesn’t seem to go anywhere. We could not find any indication that the “failures” and “unsuccessful interventions” Global Witness had identified had been addressed since. We asked the World Bank for comment but it did not reply to our request in time for the deadline one week after we emailed our questions.